Several months ago, I did a post with this sneak peak of our living room. The hope was that the photos, taken by John Bessler, for our designer, Lauren Muse’s portfolio would be published in a magazine. That day has finally come…this month, Connecticut Cottages and Gardens has featured our home in the March issue! The focus is “Rethink, Renew, Refresh-Embrace the Season of Change!” Our feature entitled “Room To Grow” written by Dana White, tells the story of our renovation project, working with Lauren Muse, and finally starting this blog. Once it’s on the magazine’s website, I’ll be sure to link to it! For now, these are the photos of our home. The day of the shoot, I took a lot of “behind the scenes” photos. I plan on sharing them here in the near future. Hope you enjoyed this tour of our newly “refreshed” spaces. Sue – SO exciting!!!Congratulations!! Just LUV CT C&G!! Your home is absolutely stunning!! But I am of course not surprised in the least! I remember when I first saw the photo of the living room that I wished I could have seen more – can't wait for the issue to be live!!! What a beautiful home you have, I love the browns and oranges in the hub's study. Oh could you tell me more about the ' elipse" painting above the fireplace – I want! Oh and great rugs – I can never find rugs. Congratulations!! Your whole house is beautiful!! The counter design in the bar top is amazing. I remember seeing the sneak peek pics! Lovely these and congrats on the magazine feature. Your home is stunning. M.
OMG SUE! Congratulations! Your house is amazing, and it deserves to be published! Your "pool house" is my absolute FAVE! you realize that you have to get us ALL a copy of that magazine, don't you? Your house is RIDICULOUS!!! My sister's best friend lives in Fairfield and has asked me for some help with ideas for her living room overhaul and I immediately sent her this link. Your living room is perfection! Are you kidding?! It's GORGEOUS!! Congrats! Fabulous house! Congratulations..Are you working with DJ Carrey? She photographed our house for one of the first issue of Cottages and Gardens. You are such a stylish gal with great taste, nice to see your home is a true reflection of you…gorgeous, gorgeous, gorgeous! My favorite aspect of all the rooms, they all are stunningly beautiful yet look functional. Well done to your designer and no doubt, you had a strong hand on creating a utterly fabulous Zhush adode! Love!! Oh My God. Seriously – your house looks like it should be in a magazine!!! Oh, right, it IS in a magazine!! gorgeous gorgeous home! congrats on the feature! Oh my goodness! This is UNREAL exciting! Your place is breathtaking….girl, you been holdin' out! This is some serious Elle Decor material you've got here. What a labor of love this must've been. A major decor feat. what a lovely blog you have, feel free to follow mine and I follow you back. Beyond gorgeous! Congratulations, I'm just surprised this is just happening now, your home is amazing. ~ I picked that up last week…and did a double take as I said, Wow. it looks like Zhush's living room that she posted…and indeed it is! Love it, so calm…pretty colors….lovely details. Where are all the random Chanel items? I thought you would have Chanel inlaid in the foyer or painted in a pop of purple somewhere…. Your home is stunning! Congratulations on your spread from th looks of your home you deserve it. One sofa in your living room, is that covered in burlap? In the third picture….it looks amazing! How exciting!! Your house is so beautiful! I love your office! It all looks so great! Congratulations on the feature! Can I also say how much I love your bathroom – love, love! All the rooms look great; it would be hard to pick a favorite. And excellent photography! 1. YOU HAVE A POOL HOUSE?! – ok i'm jeal – GO YOU girl! – freakin' fabulous!!!! – congrats to u my love! Your home is so classic yet modern and I love that! Congratulations. Look forward to seeing your behind the scenes pics too! Absolutely beautiful! Everything is gorgeous and I love all of your lighting choices. Congrats Sue. You would NOT believe how much I absolutely love your home…the styling and design is incredible! What an honor, congratulations on the feature. Have a good one! Your home is absolutely impeccable! Sue, I don't know if I have the right adjectives – they all seem to fall short! Your home is a stunner – I love every space you've shown us, but I think your office is my favorite! Congratulations!!! Sue, your home is gorgeous! Congratulations . . . you deserve this recognition! Sue, your home is truly beautiful ! I'm not surprised though, it looks just like "you". Congratulations….. Fantastic, Sue! Your home is absolutely beautiful. Can't wait to see the magazine. I am just drooling over here. So gorgeous and fresh! Congratulations on the publish, that is SO exciting! Your house is just GORGEOUS! Congrats!! Such a lovely home and such fun that it's been featured in a magazine! Can't wait for the full story. Congrats. Wow this is gorgeous! Ooh ooh behind the scenes photos PLEASE!!! A extraordinarily lovely home created for an extraordinarily lovely women. Congratulations to Lauren and you! I am speechless…absolutely beautiful- CONGRATS! Wow. When I see homes likes this in magazines I always wonder who is lucky enough to live in them – now I know! It's just, well stunning. Congratulations!! I can't stop staring. Your home is unbelievably amazing! I loved this peek into your home. The magazine feature is well-deserved because the spaces are just lovely. I am especially envious of your tub and that lavender office. I can only imagine how relaxed and productive you are in there. Not only was it a thrill to open CC&G and see your gorgeous home in the pages, I love seeing all the comments above. Putting together a beautiful home is a labor of love and you, along with Lauren, have shown all of us what is possible. You've got incredible style, girl!!!! Congratulations!! Your home is so beautiful!! it's funny, but today I posted the magazine that my home is in. 🙂 Mine is nowhere near as impressive as yours, but it sure is exciting! Beautiful photos – your home is amazing! Your house deserved to be featured! I have noticed your appreciation for patterns and soft colours, the towel in the bathroom, and the carpets are what I believe are most eye catching from all objects around. They kind of embrace, actually lay the foundations of true chic in your home! I have also loved the quote on white background picture. When you get a minute go see my Chanel quote on my blog and tell me what you think. Oh my goodness your home is just stunning!! 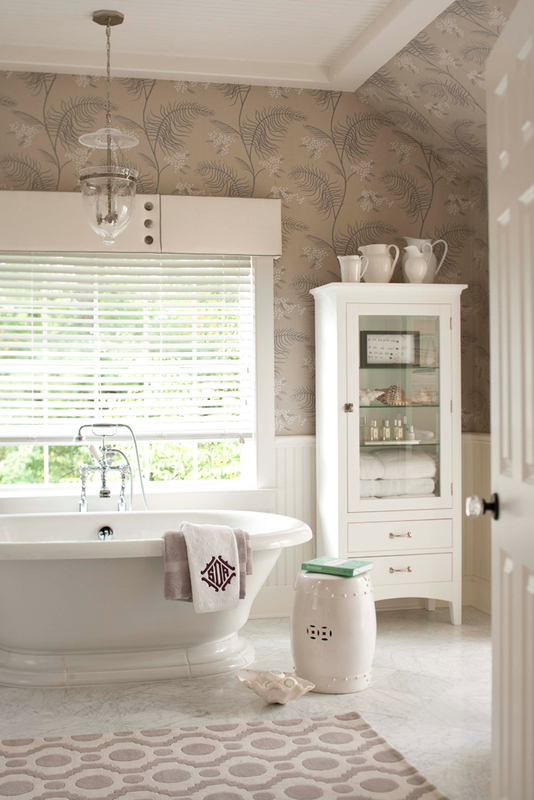 Congratulations on these photos being published.They are all so beautiful but I absolutely love that bathroom!!!!! Sue, it is amazing! Congratulations!! Incredible! I cannot believe how absolutely gorgeous your home is! Seriously, this may be my dream home for sure. Wow, absolutely stunning…Why didn't I know this…I read your blog everyday and somehow missed knowing your house was this uber beyond cool, place…although I'm not surprised! Congratulations. I'm not surprised your house is featured in a such magazine. It's beautiful, cosy and of course super stylish. The use of color together with the furniture you've chosen is per-fect!!! Your house is unbelievably beautiful, modern, natural and so much to look at! Gorgeous. Love the colours in the Mr room. And the poolhouse! It must be like a vacation every day in there. Congrats to you – you deserve to be in Vogue next! Beautiful home and pictures!! 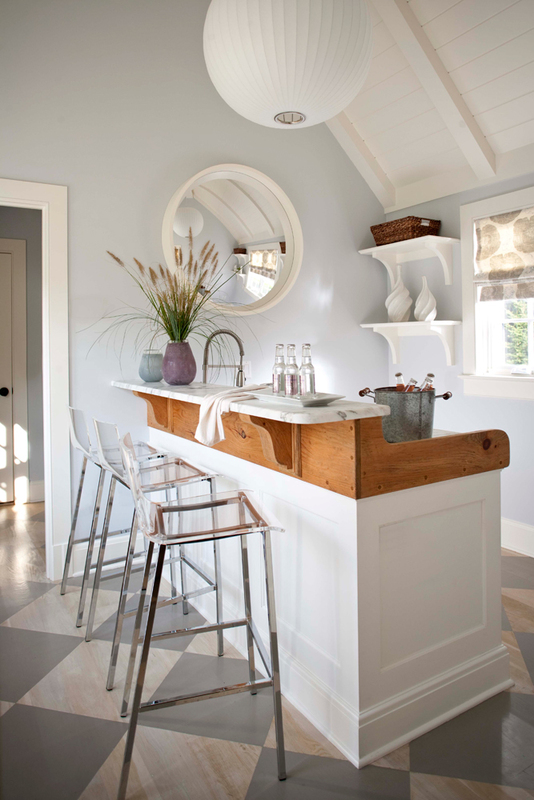 May I ask who makes and where you bought the globe ceiling light fixture in your mudroom? CONGRATULATIONS!!!!! I love your home! Love the living room with the gorgeous ceiling moulding, love your pool house, love your (never seen this before!) mudroom! Love the paneling in Mr'S office,… definetely my style!! Thank you so much for sharing these inspirational photos of your home!! Your living room is AMAZING. I love all of the white! And that poolhouse is fantastic; it's so clean and chic. You know I love it! The whole thing is magnificent! I was especially crazy over the mud room…it's a better, grander version of mine…lol! And all the details in every room throughout. A big congrats to you, your designer and the photographer. Truly beautiful work to be proud of!!! Your home is…STUNNING! I adore your ikat chairs and the pool house is divine! LOVE LVOE LOVE! Wow! Your house is absolutely stunning and beautiful! Everything is perfection! I love the mix of traditional and modern. Love love love! your home is BREATHTAKING! i LOVE IT! HUGE CONGRATS on the feature — it is absolutely GORGEOUS!!!! Congrats! Your home is amazing…..I love the expanded living room and all the windows! And love the tones in the Mr's office. OMG Sue your house is gorgeous! Congratulations!!! Adore the brown and orange ikat pillows in the Mr.'s office! THis is your home?!?!?!? Oh My Goodness!!!! Beautiful is not enough! Amazing is not even enough! Wow, I guess I'm speechless! Congrats on the feature! YAY! That is so exiting, many many congrats! Sue, are you kidding me! Your house is amazing and so looks like home that should be published. Thanks for sharing these photos with us! I love it. Congrats! Beautiful. I love the color palate. Is that a Jeff Koons dog on your mantle? Wow. Your home is beautiful! My favourite…. Mr's office! Wow, wow, wow! Love everything! Beautiful and very livable too. Wow your house is so beautiful! I love your color palette and all of the details — the compass on the floor of the mudroom is so cool and you chose such great fabrics in every room. Can I ask what color is on the walls of your pool house? Thanks for sharing! Oh, ever since the teaser I've been wanting to see more. What a fabulous home you have…not that I am surprised in the least. You and your designer have MUCH to be proud of. Love it all. And you office is another nudge towards my changing mind about using lavender. Love it all! Your home is amazing ~ no wonder it got into a magazine. I especially love the wallpaper in the bathroom and the pool house shot. Really beautiful. Oh my Gosh! This is your home!!!! It is absolutely AMAZING! You were so right about me… I DO love Dorothy Draper! As a matter of fact I just bought one of her books on line! From 1939! Sue, your home is beyond gorgeous! I am in love with every single element. Your home needs to be featured in many more magazines. Love, love, love! Well done! Beautiful, and a well deserved publication! Congratulations Sue! Your home is so beautiful! I am so happy for you and I can't wait to pick up a copy of Connecticut Gardens and Homes so I can read the full article. 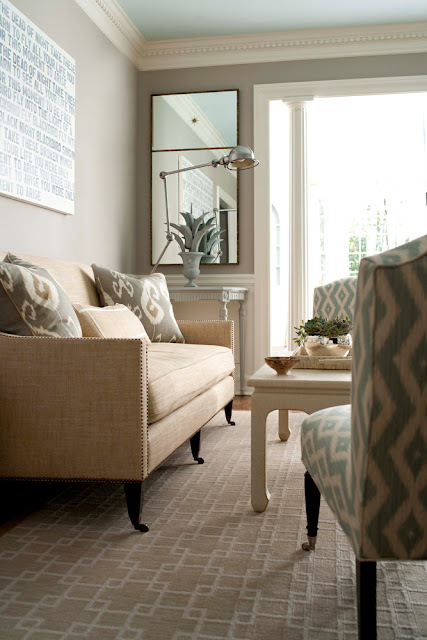 I love it all, but especially the fabrics and colors that you chose for each room! Oh my goodness…so exciting! congrats to you, and your home is beyond amazing!!! What hasn't already been said? I should just start passing out drool pans since I'm at the bottom of this commenting pile and I can feel it all running down 🙂 I am super happy for your publication debut (or maybe it's not the 1st time)!! I remember when we all went nuts over that silver balloon doggie, now we all all just nuts over you place in general. I think it's fabulous and you have a beautiful home and a beautiful family to make the aesthetics truly authentic. Your house is STUNNING!! I absolutely love it! Congrats on the feature, so awesome! This is a BEAUTIFUL home. Love the mix of styles and patterns, outstanding. What a lovely home!! Simple Fabulousness. Lovely home, many thanks for sharing. Would love to see the behind the scenes shot. Hearing more about the designing/decorating process would also be really fun to read. I'm speechless! Those rooms are stunning! Your style is the exact kind I love. Gorgeous! oh my goodness, you're home is breathtaking!! So light and airy. I absolutely love it! Hi Sue, this looks wonderful! what gorgeous rooms you have created! congratulations on C & G…one of my favorite mags! Truly beautiful house. LOVE the mr.'s office! very manly. you, lady, have an amazing talent! Sue, it's fabulous!!! Congratulations! I love everything about the space – I haven't figured out my "favorite" yet. Well done! bea.utiful. your house is amazing. congratulations! Stand down people…this is one gorgeous house! I would walk around pinching myself! WOW! Your house is spectacularly beautiful. 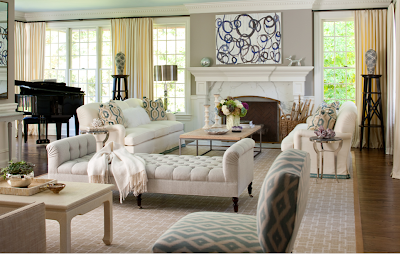 Love all of the fresh colors, the rugs, the feel of the spaces. I also love that you have a grand piano – the piano is so central in our house (all three of my kids play) that it will literally be placed in the heart of our new house! Sue, Congrats ! What a beautiful home filled with so many lively details. Using even know where to start. The mudroom floor, nailhead sofa and Romans in your office stand out most to me! Impeccably done – congratulations on the feature! Susan, I finally have some time to myself to browse my favourite blogs and I'm literally swooning over your home. Just beautiful! Congratulations!! So exciting!!! You home is so lovely! This fantastic & so exciting! Congratulations!! The word inspired does not even come close to what I am feeling right now! Your home is so impeccably decorated! Thank you for sharing! I love all your fabrics…just beautiful. Especially that Ikat in your hub's office. He might enjoy some of our hardware in there as well. Congrats on having your home featured. Just the most gorgeous home. I wish I could get that mag here in Australia but at least I get to see the beautiful pictures on your blog. I have just read through all of your comments (whew) and no one else asked this so am feeling like I am at risk of displaying my ignorance but…what is that on the cornice, reflected in the mirror (3rd picture)? Appears to have 8 "legs", haha. WOW! every room – stunning!!! Congratulations on the feature! Your home has left me speechless! I found your blog via marcus design and so glad that I did. What a tremendous job you have done. so awesome, so beautiful, and i am SO jealous!! your home is Gorgeous!! congratulations on being published! In all seriouness, congrats on being featured, what an honor…and well deserved! Congrats….so beautiful, love the renovation! oh, i am so impressed! and what an honor to be featured in a magazine! can i move in? Love the colors in or office and the Roman shade…the wallpaper in the master bath is great! So happy for you! Sue, I just did a post of Lauren Muse of Muse Interiors and I had no idea that was your home featured in this month's CT Cottage & Gardens. Christine from bijou & boheme brought it to my attention. First, congrats! Second, your home is completely stunning!! Absolutely gorgeous! It will be saved in my inspiration file for a long time!! Your entire house is literally perfection. If I could buy it, and all the furnishings, I would. Where are the ikat pillows from? I'm in love! Where did you find the fabric for your pool house blinds? I love it! Ok you are probably sick of telling people where you bought all your stuff but really – you did a wonderful job! Wow i love your blog its awesome nice pictures and fantastic cottages information you must have did hard work on your blog! Your home is beautiful and so exciting…everything look so fresh and clean…like it.